1. 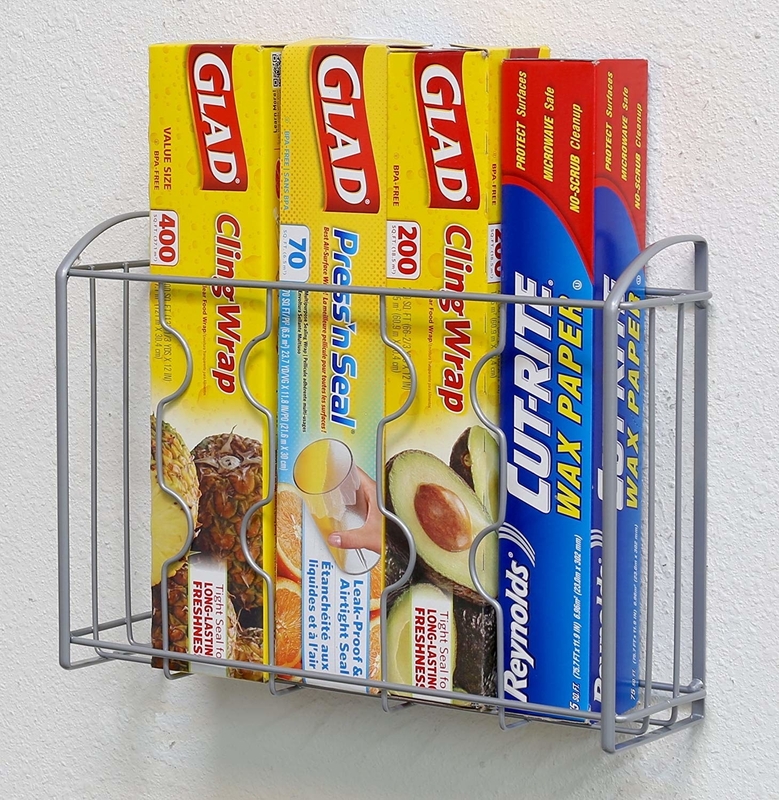 The classic over-door shoe organizer — it's definitely the ultimate multipurpose storage solution, perfect for everything from dolls to cleaning products to makeup to pantry staples and more. You could even turn it into a hanging vertical garden, if you felt so inclined. Get it on Amazon for $7.97. 2. 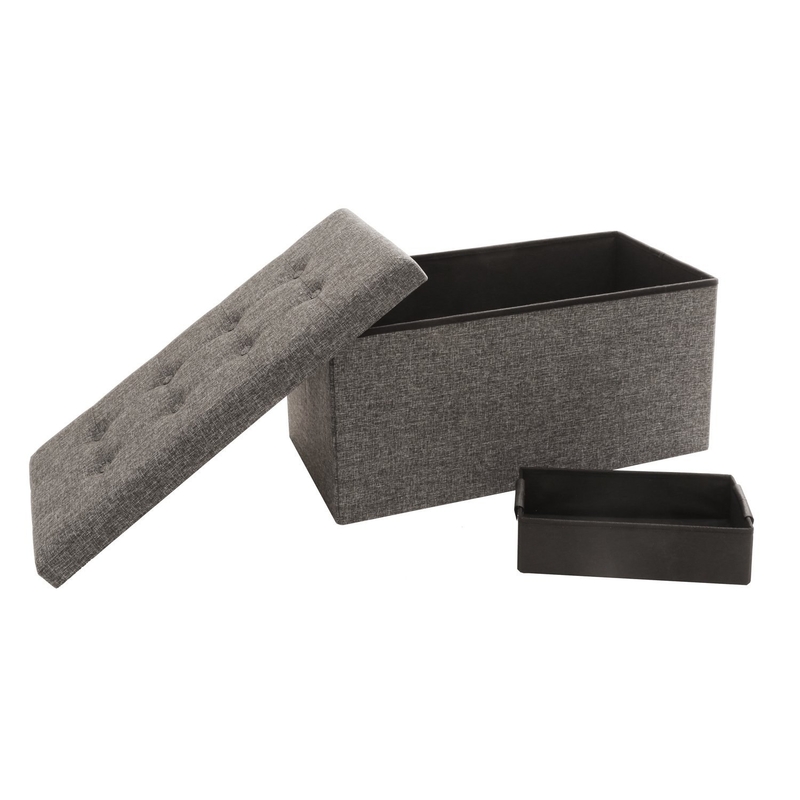 A storage ottoman to stash away messy clutter (like toys or shoes) *and* provide an easy spot to sit down for a moment (maybe to put on said shoes) or prop up your feet after a long day. "I purchased this for my son's nursery and am extremely pleased. Pros: Well made; stitching is impeccable. Inexpensive. Doesn't look cheap; great looking fabric and a hefty design. Extremely durable; I thought I was buying a dinky storage ottoman, but a full grown adult can stand on this and it'd hold up fine. Provides extra storage. True to color shown online. Get it on Amazon for $34.99. 3. 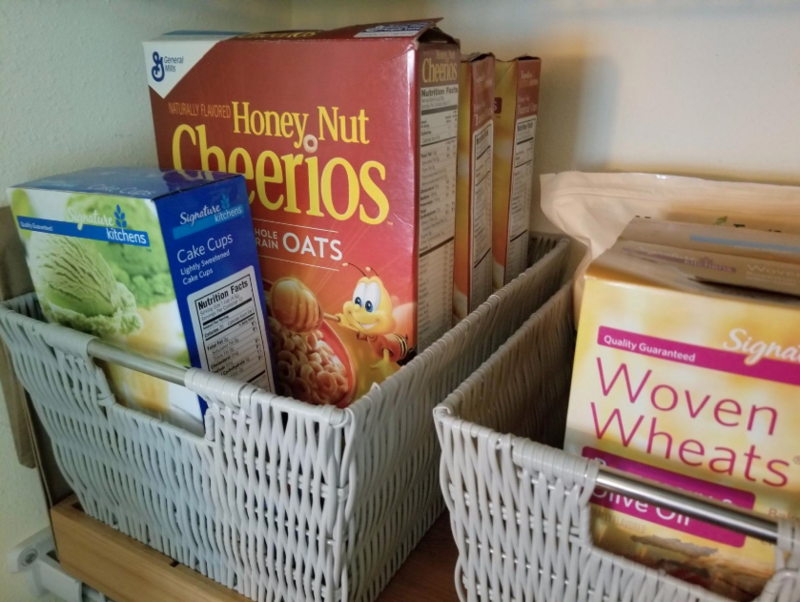 Simple woven storage baskets that corral whatever clutter you clash with most — whether its in the pantry, on your counters, in your kids room, or somewhere else — while still looking homey and decorative. Promising review: "Cute and functional. Will definitely last a while bc although it looks like a bronze wicker it's more of a plastic resin material which is a bonus for durability! Love the color. Just what I wanted!" —L.S. Get this set of three nesting baskets for $20.99+ on Amazon (13 colors available). 4. 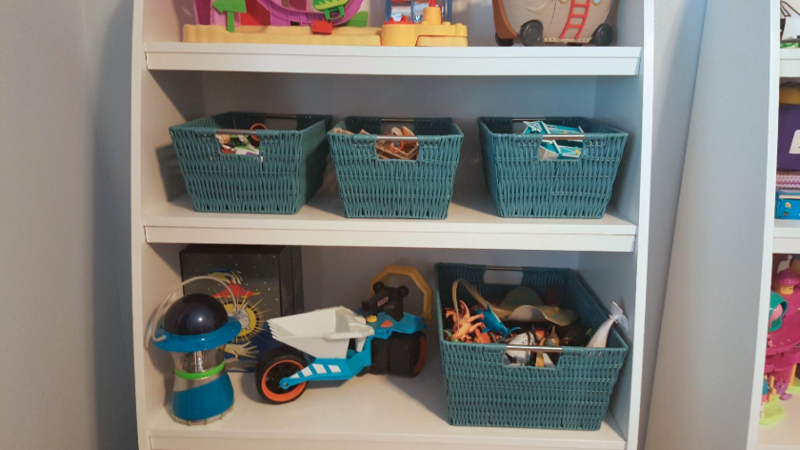 Several baskets for setting up a ~crap basket~ system if your family always leaves their stuff laying around the house. You simply drop abandoned headphones, chargers, flip-flops, scarves, books, and other stuff that's left where it doesn't belong into that person's basket for them to put away later. From Sew Many Ways. Get a set of four woven baskets the right size to sit on stairs on Amazon for $36.95. 5. 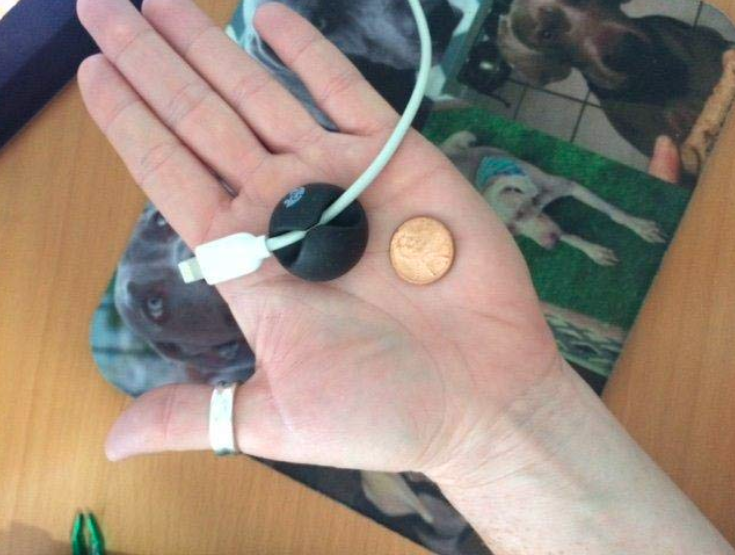 A pack of silicone button-bands that hold basically anything together because they're like oversized, reusable rubber bands. 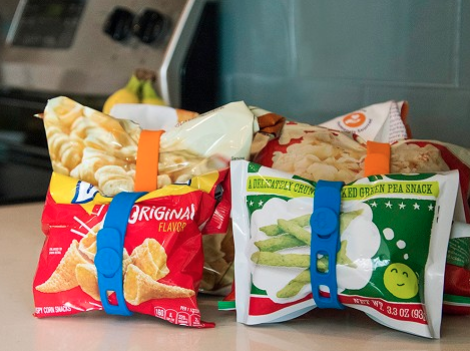 Get them on The Grommet for $20+ (three or six packs available) or Amazon for $20 (three pack). 6. 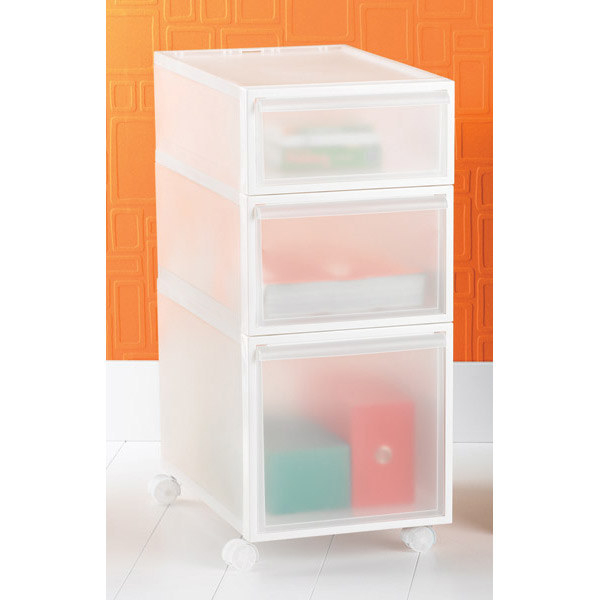 A set of clear, stackable modular drawers perfect for orderly storage of collections: things like craft supplies and makeup or a kiddos Legos or dolls. Or even to take up some of the unused floor space in your closet — if you're lucky to have such a thing! 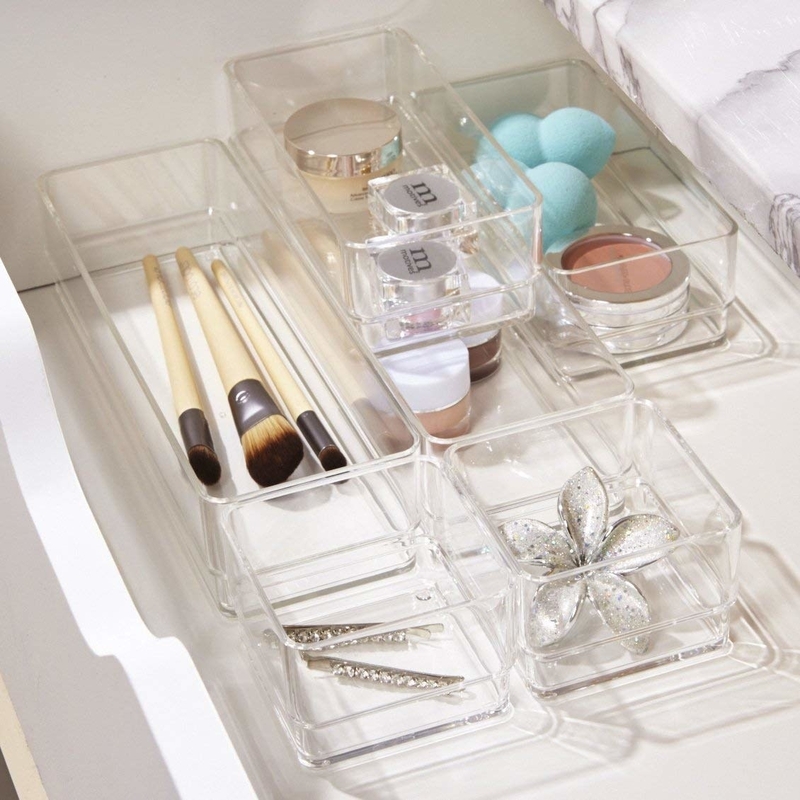 Get them on sale from the Container Store for $19.99+ per drawer. 7. 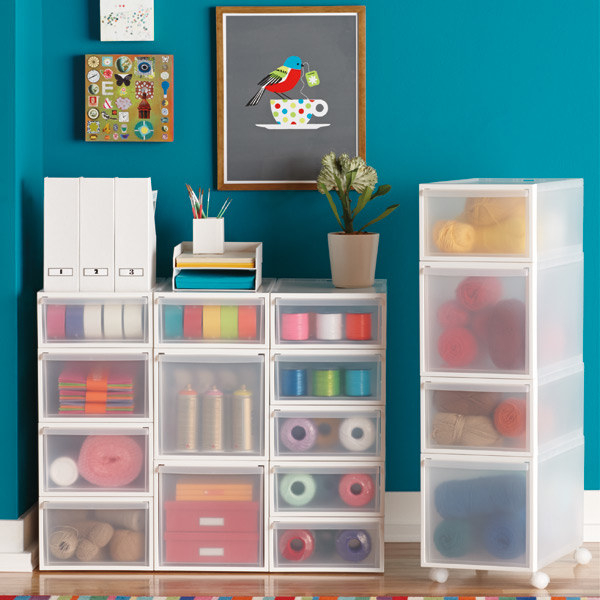 And a set of four small plastic drawers that can divide all sorts of small spaces into easy-to-access sections. Get the set of four on Amazon for $32.06. 8. 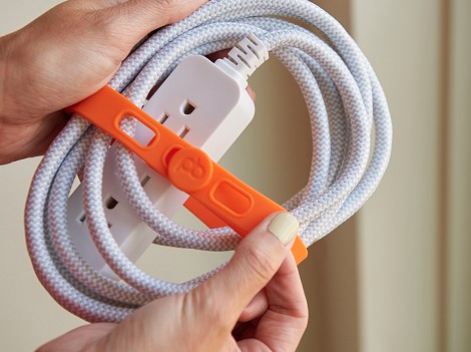 A set of six cable clips to keep your charger easily accessible, detangle your computer cords, and even (whoa) hold everybody's toothbrushes. Get them on Amazon for $8.98. 9. 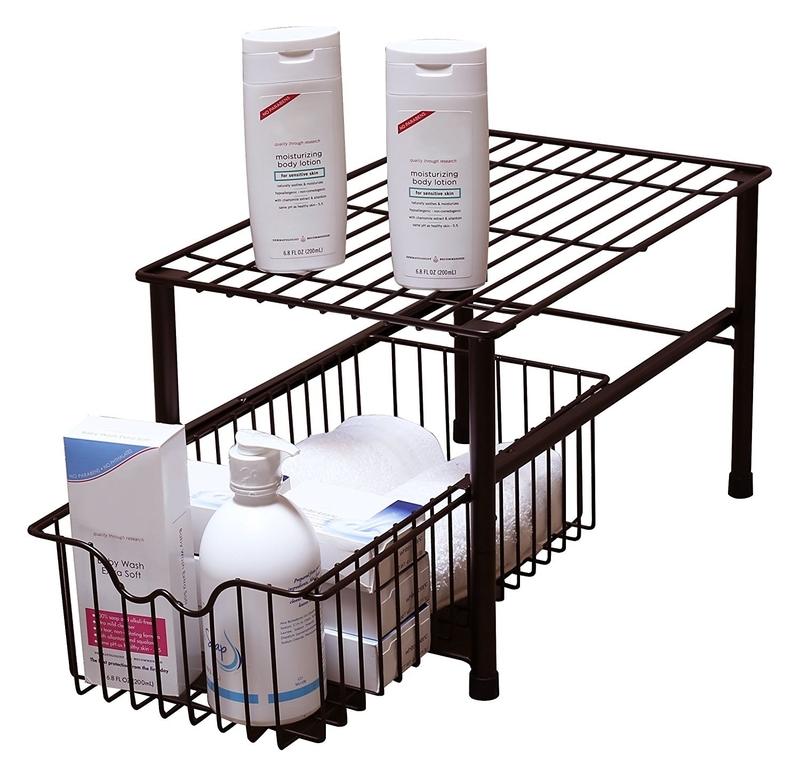 A wire drawer and shelf combo for maximizing every square inch of space you have under your bathroom or kitchen cabinets. 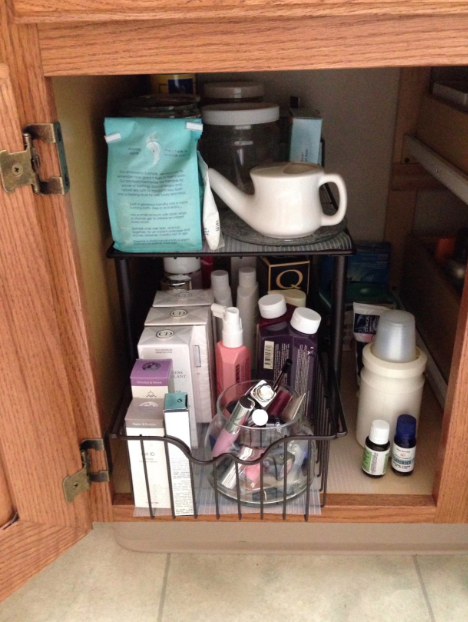 They're also stackable, if your cabinets are high enough! Some reviewers even use them as tabletop storage, or stack them up on their kitchen floor for potatoes and onions. Get one on Amazon for $24.87. 10. 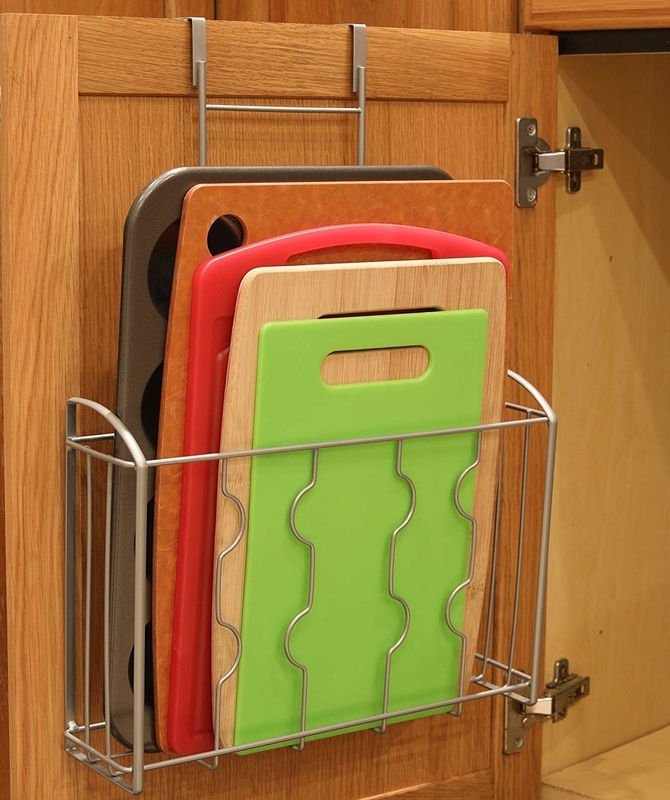 A slim kitchen organizer that stores basically whatever you need stored, and hangs over the door for renters or mounts to the door (or wall!) if you own your home. Reviewers use it for cooking spray and oils, sheet pans, condiments, cleaning supplies, and even medium-sized liquor bottles! Get it on Amazon for $13.87. 11. A full-length mirror to help you feel confident about your outfit every morning (this one even takes it a step further: it includes built-in jewelry storage). Storage mirrors FTW! You can also mount this to the wall, if you so choose. Get one on Amazon for $129.99 (available in brown and white). 12. 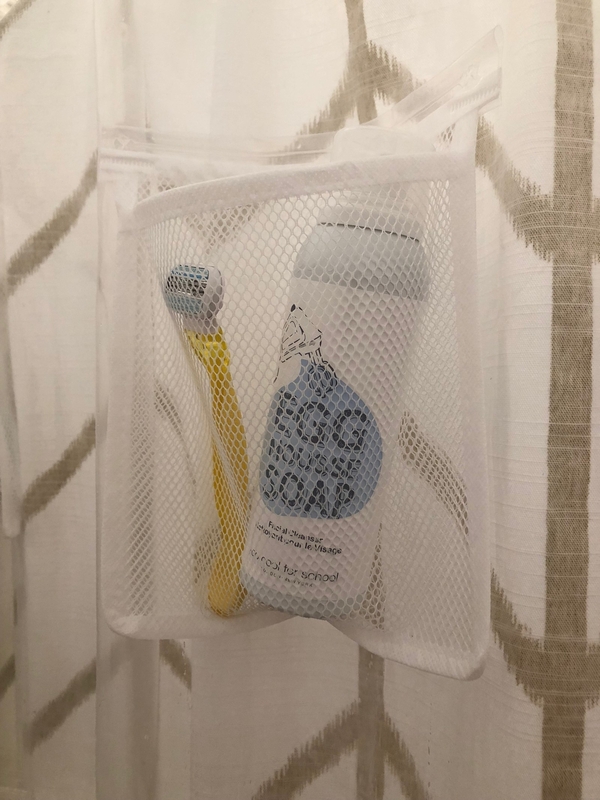 A pocketed shower curtain liner that can store all of your stuff while still keeping all the water where it belongs (inside your shower, of course). One of our editors uses this in her shower and loves it — read her review. Promising review: "I have four boys and a husband and one bathroom that only has a small shower. Just picture that for a second. My bathroom is so small you can take a leak and rest your head on the sink at THE SAME TIME. 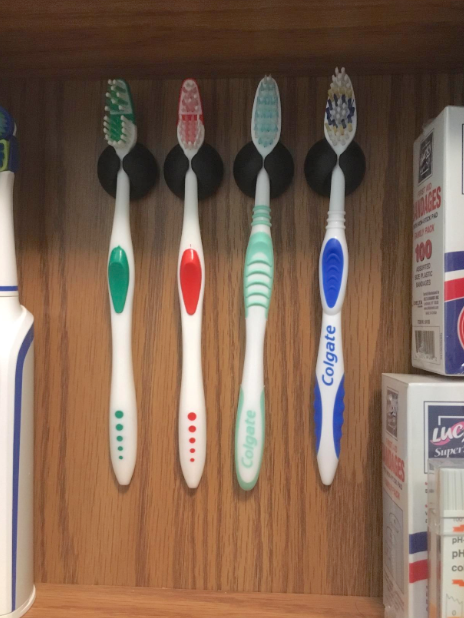 Every child and adult has their own body wash, shampoo, loofa thing, and adults have razors. So that's 6 people using one small shower that literally has no space to store things. I was afraid this thing would rip with how much crap I was gonna store in it. Nope. It didn't. 13. 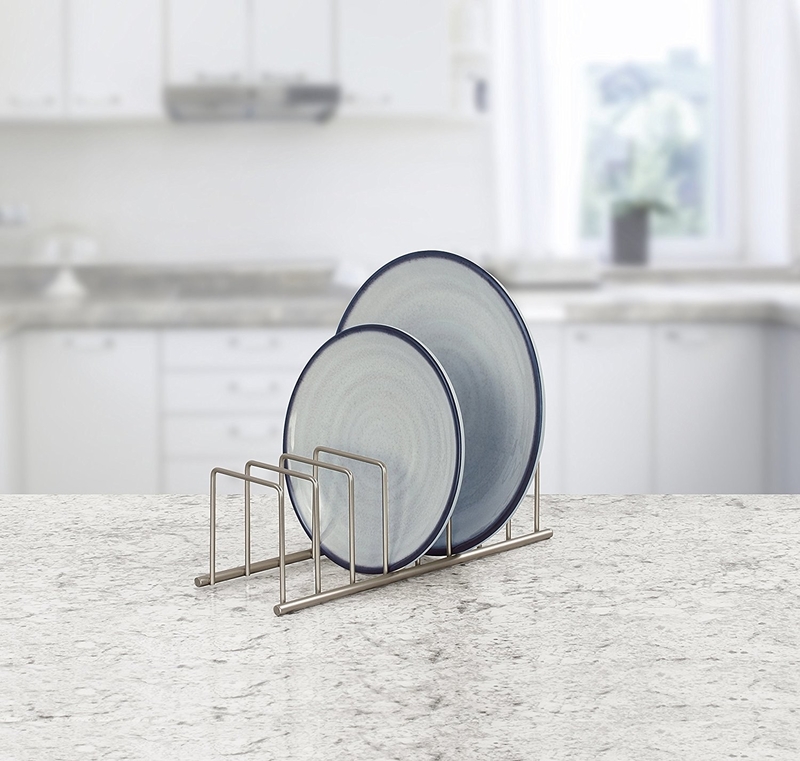 A simple rack — it's originally designed to stack plates but can also sort out lids, sheet pans and cutting boards, paper files, and even your wallet or clutch collection. 14. 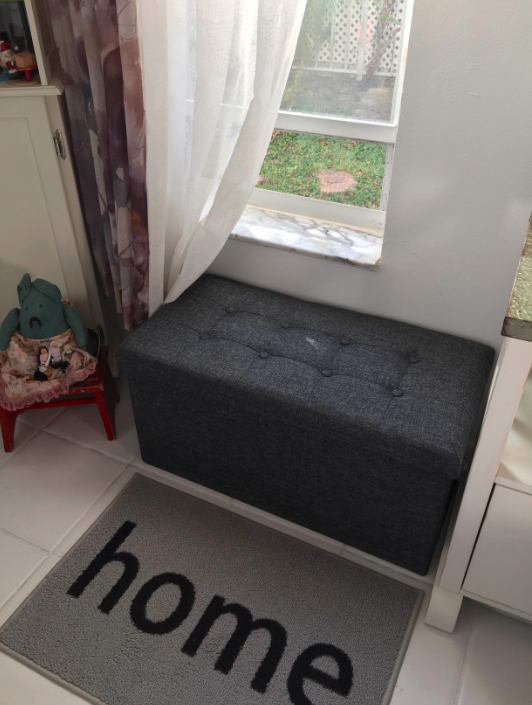 A combination coat, backpack, and purse rack with key holder hooks, a mail storage slot, and bonus shelf — it essentially turns a 24"x12" piece of wall space into a miniature mudroom. "Looks amazing and takes a beating. I use this more than I should but it has stood up to the test. I have a very heavy hoodie, one full purse, three empty rotation purses, two sweaters, mail, a camera, and two sets of keys on there and I couldn’t have asked for a better entryway wall piece. Of course it looks much more chic when it's not overwhelmed with my junk. It’s perfect." —Sierra K.
Get it on Amazon for $54.50. 15. 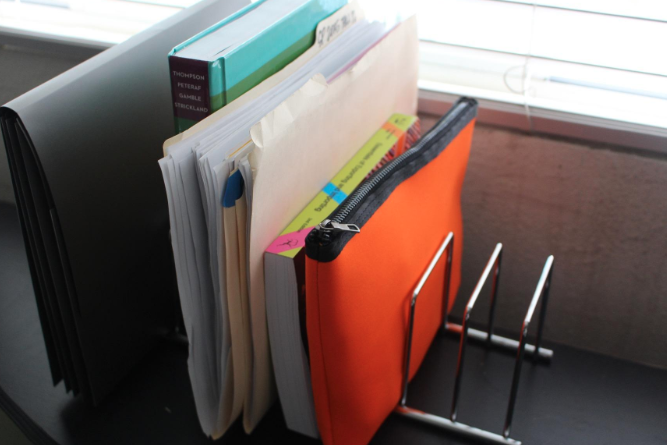 A plastic, removable-adhesive caddy you can attach anywhere you need a little boost of extra storage. Promising review: "These shower caddies are amazing! I followed the directions and cleaned the part of the wall where they were going to be placed, stuck the Command Strip on, and let it dry before installing the caddy and loading it up. 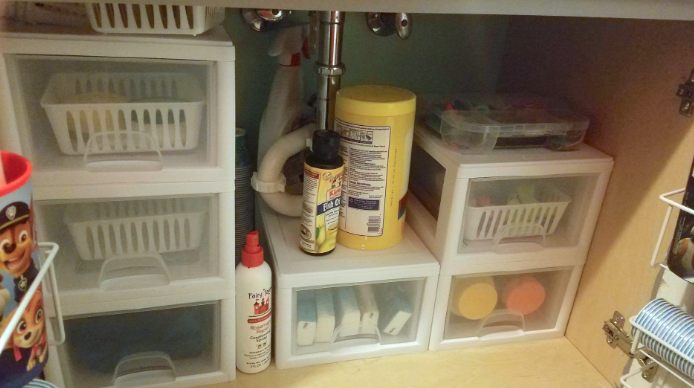 We have two installed in our one-piece fiberglass tub/shower area (his & hers) and they easily hold several full sized bottles of shampoo, conditioner, body wash, etc. Get it on Amazon for $6.88. Photos: M, Synesthë, Useful Gadget Guru, and Elisabeth. 16. 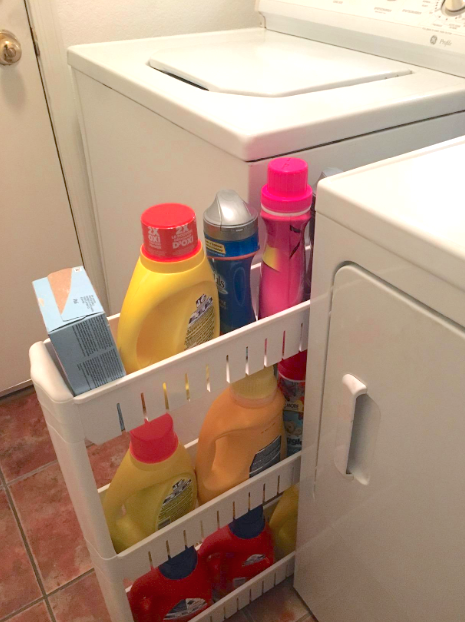 And of course, classic removable adhesive hooks to organize dozens of things — limited only by your ~imagination~. 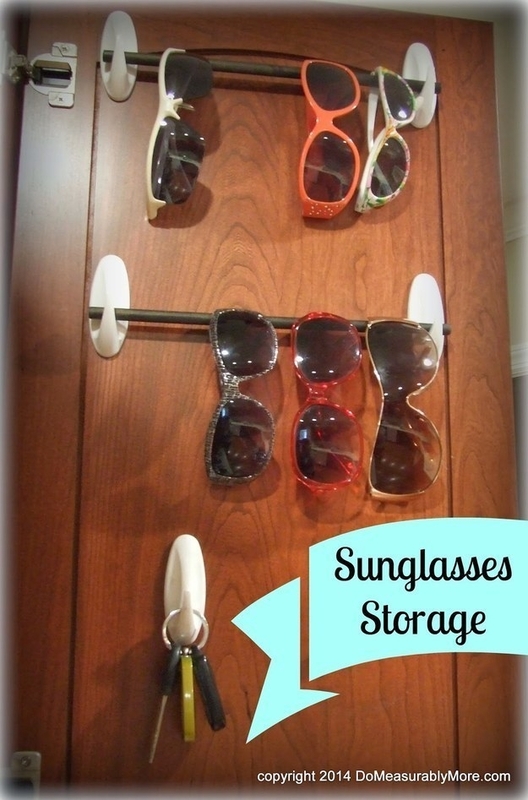 Sunglasses storage from Do Measurably More — and browse 36 other ways to use Command Hooks. Get a pack of nine hooks and 12 strips on Amazon for $8.99. 17. 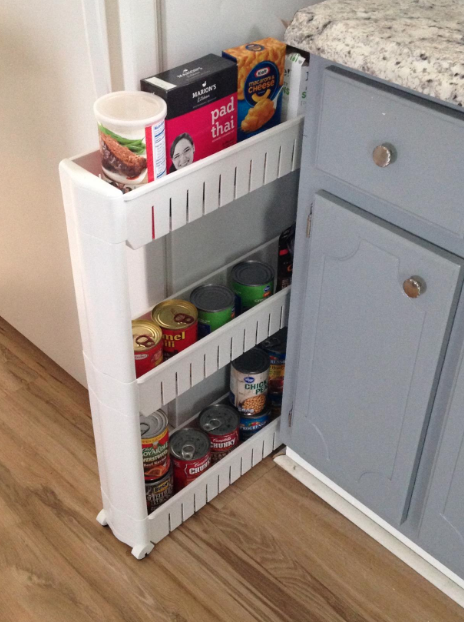 A narrow rolling cart that magically takes narrow wasted space (anywhere in your home) and turns it into incredibly useful storage. 18. A set of three mini-drawers that'll instantly sort all the smallest things in your life into neat and orderly categories. 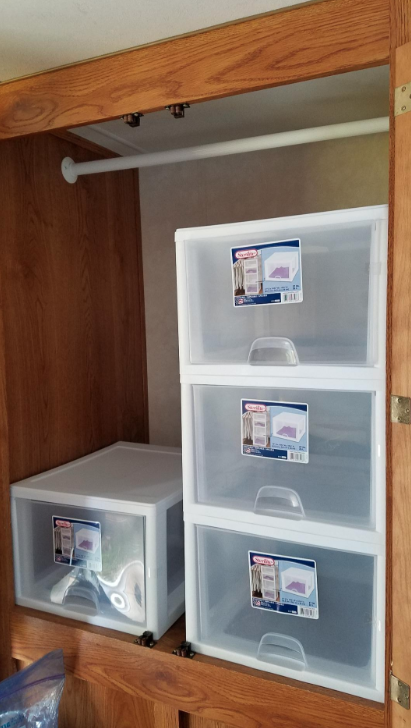 Get two three-drawer containers on Amazon for $16.54. 19. 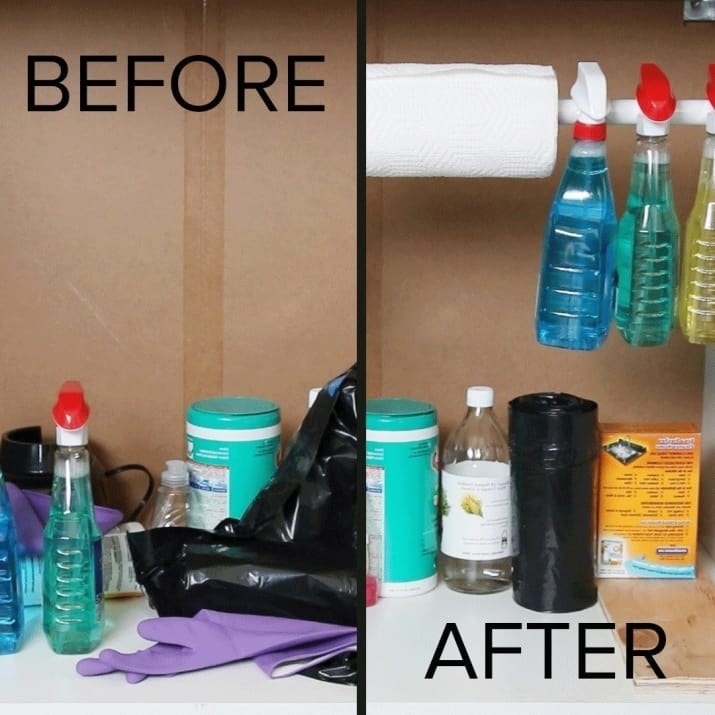 A simple shower curtain tension rod for neatening up everything under your kitchen sink or adding a second row of storage to a bathtub. 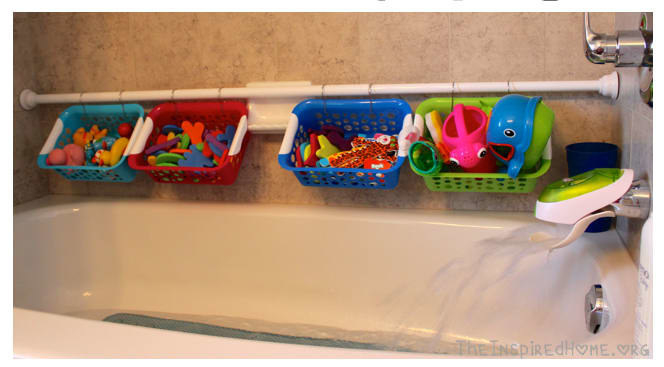 You could also hang the tension rod at grown-up height, and use baskets to store your soaps. Or put one up in your laundry room so you have a space to hang stuff to dry. The sky's the limit! From Nifty and The Inspired Home. Get a highly-rated tension rod on Amazon for $20.45. 20. 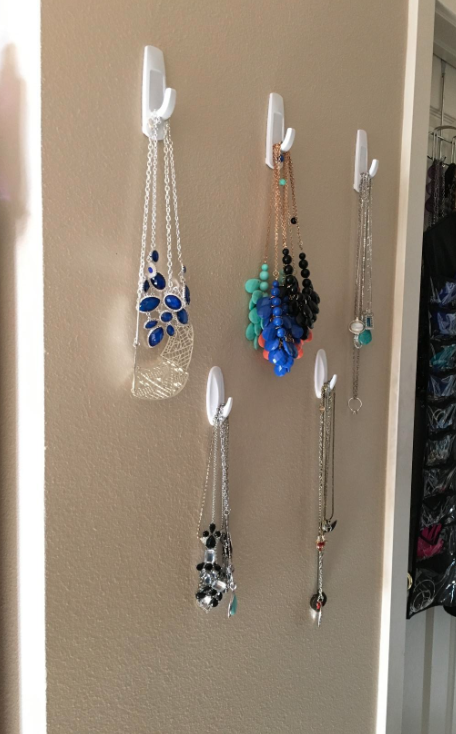 This set of hanging shelves that'll make it easy to reach any folded clothes or accessories without sacrificing even an inch of space for clothes on hangers. Get it on Amazon for $21.03. 21. 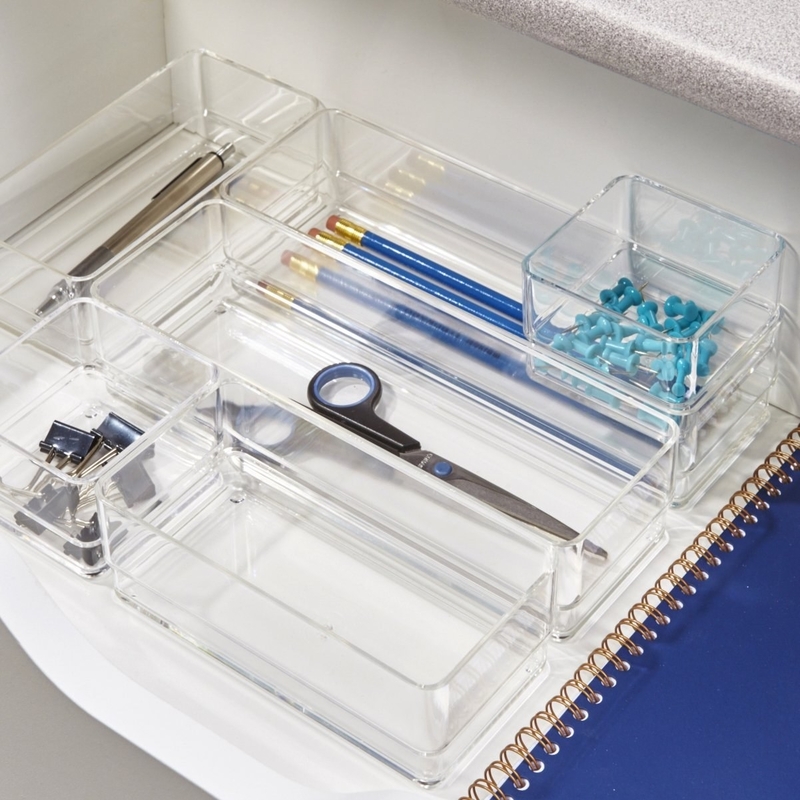 And stackable, shallow, clear drawer organizers to divvy up any drawer — kitchen, bathroom, or desk — so you can actually find what you need. Get the set of six organizers on Amazon for $14.99.